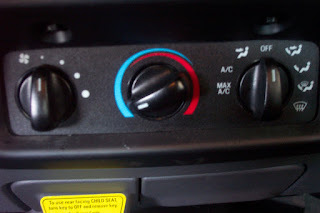 KOOL KAR AUTO REPAIR: Why Does My Car's A/C Smell so Bad? Why Does My Car's A/C Smell so Bad? If your car's A/C smells horrific when you first turn it on, most likely it's due to mold and mildew that has built up on your cars evaporator. How can this happen you might ask? A/C odors usually result from growth of bacteria and other microorganisms. How do they get there? They are present in the outside air we breathe everyday. They are drawn into the car thru the A/C system during operation. Moisture is a big factor in the formation of odor. Most of this moisture drains off the evaporator and releases thru a drain in the evaporator case. Some of the moisture clings to the evaporator after the Air Conditioning is turned off, making the evaporator a perfect breeding ground for bacteria, mildew, and mold because it's warm and dark inside. Another thing that adds to the dilemma is cigarette smoke. If you are a smoker the tar, overtime, will cling to the evaporator creating a sticky condition for everything in the outside air to stick to the evaporator. How do you get rid of the odor? The best way is to bring the car to Kool Kar Auto Repair and have the evaporator professionally cleaned and deodorized. There are some things you can do on your own to prevent this from happening in the first place. For instance the last few minutes before reaching your work or home where the car will be setting for a long period of time, turn the A/C compressor off but leave the fan on full speed. This will help dry out the excess moisture in the evaporator. Don't smoke in your vehicle, if you can't resist roll down the window when you smoke. Some people put fragrances in the car, this only covers up the odor and the oil in the fragrance will also stick to the evaporator. The only proper way to treat this problem is disinfect it with something like Lysol spray if you are trying this yourself. This product must be sprayed into the air intake where the cabin air comes into the car. When you have your evaporator professionally cleaned we go directly to the evaporator, if possible and clean it with commercial cleaner especially designed for this problem. It will kill everything growing on the evaporator but is environmental friendly and won't harm you are your family.